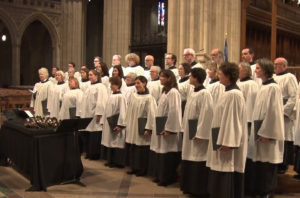 The West Gallery Choir is returning to the Washington National Cathedral to sing a choral prelude on February 3. The a cappella prelude includes Shape-note hymns, Gregorian chant, and 20 th century compositions by Will Todd, Patrick Hawes, Eriks Esenvalds, Bobby McFerrin and Sufjan Stevens. The choral prelude begins at 3:25 p.m. and is immediately followed by Evensong at 4:00. We’d love to see your face in the congregation.